Immobilized columns are designed for solvent flexibility for the resolution of compounds with limited solubility, outstanding solvent tolerance and excellent separations of enantiomers. All kinds of solvents can be used with these columns- hexane, IPA, EtOH, MeOH, THF, CHCl3, 1,4-Dioxane, MTBE, Ethyl Acetate, CH2Cl2, Acetonitrile, DMSO, Water etc. The immobilized columns are used for applications ranging from analytical method development to large-scale enantiomer resolutions. 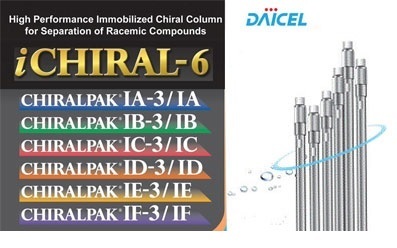 Driven by the need for increased productivity in the lab, Daicel Corporation has introduced the first sub-2µm immobilized chiral columns, CHIRALPAK IA-U and CHIRALPAK IC-U. The ultrafast separations provided by sub-2 µm columns speed-up initial drug discovery and enable rapid high-throughput screening and method development. These columns are designed to be used with Ultra-High Performance Liquid Chromatography (UHPLC) systems to achieve ultrafast and high-resolution of enantiomers.